On February 21, it reached 80 degrees in Washington, DC — the earliest date on record to achieve a temperature so high in the city. Since then, the weather has been unusually mild, and the environment has responded accordingly. Cherry trees are budding, spring flowers are shooting up out of the ground. In sum, it feels like spring has arrived, four weeks ahead of schedule. And it’s not just happening in Washington. For almost the entire West Coast, Southwest, and mid-South, spring is weeks ahead of schedule, as this helpful map from the US Geological Service shows. The map is built of a model of 50 years of data linking temperatures to first spring buds. And it’s pretty accurate in determining when spring has arrived in an area — and whether the day is behind or ahead of schedule. You’ll see that much of the map is blank (like in the Northeast and Midwest). That just means spring hasn’t arrived yet in these areas. In the South, spring buds and leaves are arriving a few days later than average, due to oddly cool temperatures there. 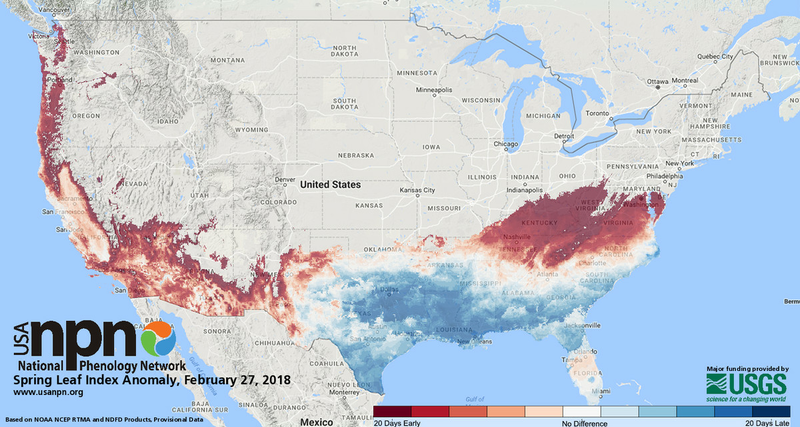 “If spring has arrived, the map gets color: blue if it’s relatively late, and red if it’s relatively early,” said Jake Weltzin, the USGS’s director of the National Phenology Network, the department dedicated to studying the timing of seasonal events. Also, if another frost does occur, baby flower buds could be killed off before they get to bloom (sad!). “Even something as seemingly simple and beautiful as flowers blooming earlier can disrupt the critically important link between wildflowers and the arrival of birds, bees, and butterflies that feed on and pollinate the flowers,” the USGS warns. 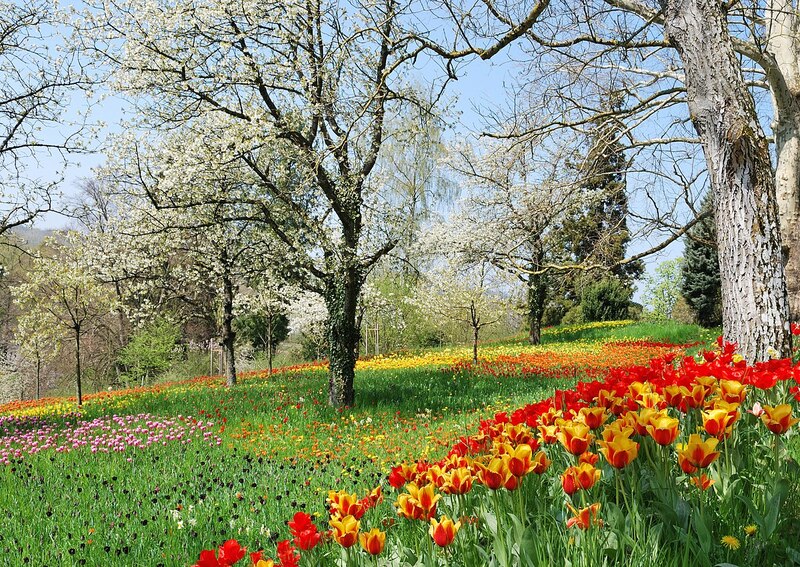 Early springs are a sign of a warming planet. And they’re becoming more common. “We’ve known for over a decade now that climate change is variably advancing the onset of spring across the United States,” the USGS writes. The world is clearly changing — the Arctic is currently warmer than it’s ever been while still plunged in winter darkness, global sea ice is nearing record lows, and 2017 was one of the top three warmest years on record. These trends aren’t going away. But enjoy the nice weather!